With today’s selection of modern sound bars being so blase in terms of aesthetics, the simple black and silver accented looks of the Philips Fidelio HTB9150 come across as the prettiest of the lot. Build quality for the two-piece system is quite good. The sound bar component does sit a little high, and this might block the IR receiver on some HDTVs. The Blu-Ray player on the HTB9150 offered snappy operation, with load times being the shortest of the three tested this month. Its 3x3 icon layout was also the easiest to navigate. While the smart features include a web browser and a host of applications, it falls slightly short when compared to the expansive suite offered by the Samsung HT-E8200. Out of the box, the HTB9150 has subdued mids and trebles. Tweaking with the EQ settings however helped us get better (and balanced) audio. The sound bar performed well for the music portion of our testing segment, delivering a faithful rendition of Michael Jackson’s This Is It. Particular high points of the testing included a warm, emotive rendering of Melt My Heart To Stone, and impactful bass for Elements Of Life by DJ Tiesto. Philips advertises the HTB9150 as having “AmbiSound” technology to help provide greater realism to audio. The sound bar tries to achieve this by having angled drivers as well as utilizing array processing; succeeding to a good degree. The HTB9150 has an expansive soundstage which helps it tackle movie audio with aplomb. 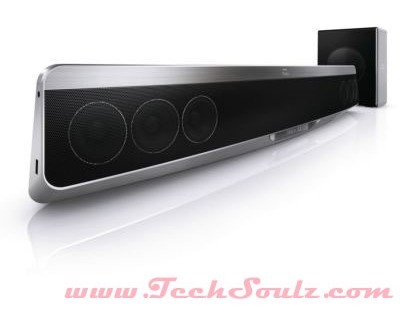 Taking into account the balanced sound, this sound bar gave the best showing of the trio. As can be expected, a single HDMI output and two HDMI inputs are available for hooking up the sound bar to other devices. The rest of the connectivity options don’t match up with the other contenders though; while composite and Optical channels are available, only DLNA is present for wireless connectivity. Samsung chooses to leave out Bluetooth connectivity, preferring that users instead use DLNA to connect the sound bar to your home network.